Inspired by Dera Saccha Sauda chief Gurmeet Ram Rahim Singh’s movie debut in Messenger of God (MSG), Pope Francis has decided to venture with PK’s director Rajkumar Hirani’s next venture to bring anomalies of all the ‘other’ religions in very light and subtle ways. Pope has confirmed this news and said that the movie would not be man-made but god-made. “Just today I have seen extraordinary and totally divine movements of Sir Ram Rahim Singh. It inspired me so much that I immediately demonstrated few of my mysterious moves to my good friend Doctor Alberto Gasparri like punches or flying in the air like Superman, etc. I also called Sir Jesus (Jesus’s name popularised by Yash Chopra in Western World) from my special phone and asked his permission for demonstrating these qualities publicly. 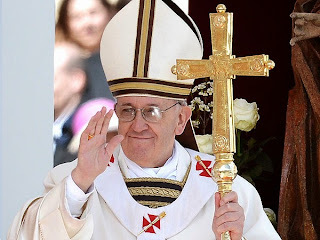 To show them in proper way I plan to release a movie on myself,” Pope Francis told India Satire correspondent on phone. Pope also contacted Ram Rahim Singh, asking why he didn’t choose to put Jesus among all these characters of his name. He suggested to put Ram Rahim Jesus Singh, although Dera Saccha Sauda chief Gurmeet Ram Rahim Singh told him that he considers Jesus is in his heart. When India Satire correspondent called Hirani to confirm the news, Hirani’s secretary told the correspondent that he was busy in selecting words in hindi to reflect best punch for word or action ‘punch’. “Few punchlines like ***** maa*na or ***** pe ***th are the best to use instead of action or word ‘punch’ for the movie’s Hindi version. It’s like if somebody mocked my faith then ‘g***d m**o u**i’,” said the secretary. ← How did Bangkok get its name?